Open every day from 9.00am to 11.00pm including Tuesdays. On 24th and 31st December, open from 9.00am to 6.00pm. Last admission : 45 minutes before closing. Galleries are closed 15 minutes before Grand Palais closing time. Claude Monet painted restlessly for 70 years, and his work embodies the purest expression of Impressionism, becoming at the turn of the 20th Century one of the foundations of modern art. The exhibit at the Galeries nationales du Grand Palais studies this rich and prolific career path. This retrospective is the largest exhibition in France dedicated to Claude Monet since 1980. In the meanwhile researches on the artist have shed a new light on less known aspects of his work. Organised on both thematical and chronological axis, the exhibit traces the artist's career, from the early works in the 1860ies to the ultimate paintings linked with the Nympheas cycle of the Musée de l'Orangerie. The young artist chose rather traditional motives, woods and beaches. Initiated to the open air painting by Boudin and Jongkind in Normandy, the region of his childhood, he painted seascapes but also 'snow effects'. Then in Paris and its suburbs, especially at Argenteuil, in the 1870ies, his bright and colorful landscapes of the river Seine mark the full blooming of Impressionism. In the 1880ies, Monet painted on several locations of western and southern France. Belle-Ile (1886) or the Creuse (1889) offered him very different motives. Thus, thanks to each of these painting campaigns, Monet could build his own vision of nature. His studies of light and atmosphere became more and more important to assess his artistical personality. Monet was undoubtedly a landscape painter, but he also painted figures and still lives. With 'Luncheon on the Grass' or 'Women in a Garden', Monet added the challenge of open air. These masterpieces almost never leave the musée d’Orsay. For the first time, they are shown together with indoor and outdoor scenes of the same period lent by foreign collections, forming a unique ensemble. Later on, figures and portraits were treated on a more suggestive and decorative manner. Characters blend into a realm of efflorescences and color vibrations, an "envelope", that makes them look rather unreal. The same evolution can be noted on the still lives. 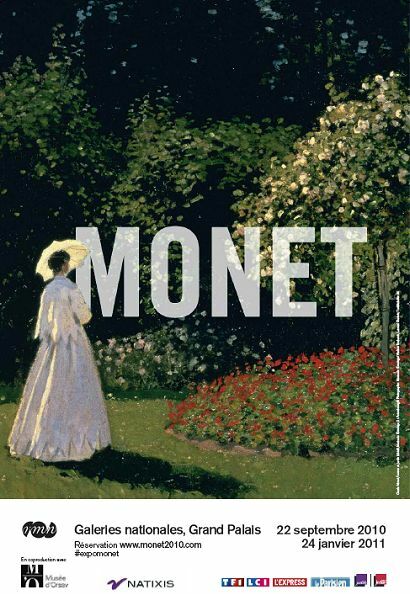 Celebrating a world full of vitality, Monet's still lives offer by the end of the 1890ies a more meditative vision. The objects loose their materiality for the benefit of color and light plays. In 1890, Claude Monet, who was 50 years old, created his garden next to his home at Giverny and painted the surroundings. He worked according to the process of series, painting several canvases with the same motif but different light effects to study the changing light at different times of day and season. Monet also produced decorations for art collectors, like Ernest Hoschedé or his art dealer Paul Durand-Ruel. In the 1890ies, when the decorative qualities of painting started to offer the promise of a renewal, Monet invented his own way, conciliating his deep attachement to nature with his own poetic world. Thus, with Monet, "dream becomes reality", to quote his friend the writer Octave Mirbeau. The cycle of the "Grandes Décorations de Nymphéas" establishes Monet as a decorator. It is the outcome of Monet's researches. Through nearly 200 works, this exhibit hopes to arouse surprise, reflection and delight of visitors thanks to famous or little-known paintings, and also thanks to unusual bringing closer of works. The exhibition wants to renew the approach of an artist who led from the 19tieth to the 20ieth Century. This exhibit is produced by Réunion des musées nationaux and musée d'Orsay. Under the patronage of Monsieur Nicolas Sarkozy, Président de la République française. Theis exhibition has been realized thanks to the exclusive corporate sponsorship of Natixis.